From Ariana Grande to Childish Gambino, Chicago’s Lolapalooza will be a wall-to-wall weekend of music stars. The event, set for August 1-4 in the city’s Grant Park, will feature more than 125 performers on multiple stages over the four days. The schedule has not yet been released. The Lolapalooza event offers a variety of ticket options, including the VIP Experience and Platinum Experience tickets. VIP Experience ticket holders get everything from access to lounges with great views, complimentary food and beverages, golf-cart rides between stages, as well as access to massages, hair styling, and more. Within the exclusive lounges, viewing platforms have been set up to provide better sight lines. VIP Experience ticket holders also have a dedicated entrance to the event and premium restrooms. Platinum ticket holders are entitled to all VIP perks, as well as catered meals, complimentary Wi-Fi, unlimited in-and-out privileges, and more. 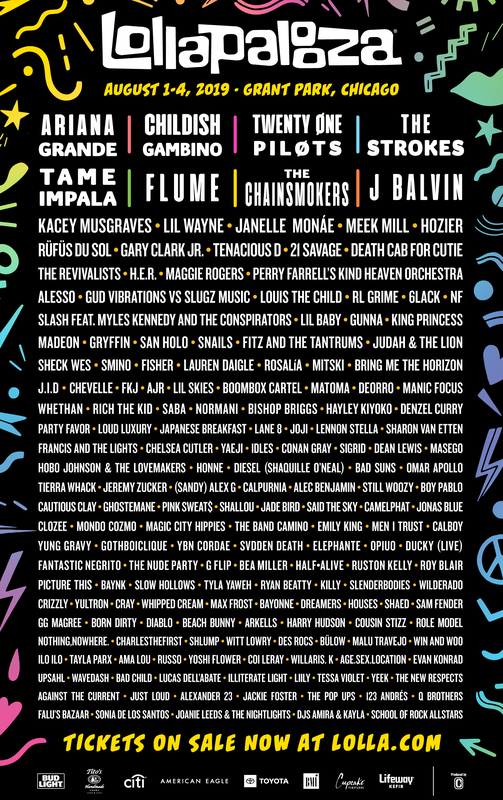 Primary market tickets are available on the Lollapalooza website beginning at $340 for general admission, up to $2,400 for a four-day Platinum package. Cabanas and one-day admission are also available at lollapalooza.com. Lolapalooza has been held in Chicago since 1991. Ariana Grande won her first Grammy earlier this year for Best Pop Vocal Album for her latest release, “Sweetner.” She’s been nominated for six Grammy’s since 2015. The album debuted in August 2018 at No. 1 on the Billboard 200 list and she did four concerts promoting the album. Childish Gambino, aka Donald Glover, isn’t only a singer, he’s also an actor and comedian with film credits and a starring role in the FX series, “Atlanta.” He got his start on “30 Rock,” when Tina Fey hired him as a writer. As a musician, Glover has released three albums and won a Grammy for Best Traditional R&B Performance in 2017, and in 2019 for Song of the Year and Record of the Year for “This Is America.” The award marked the first time a rap song won Record of the Year. Among the other performers of note that will be at the festival are Lil Wayne, Kacey Musgraves, and Twenty One Pilots. Lil Wayne released his most recent album, Tha Carter V on September 27, 2018. It debuted at No. 1 on the US Billboard 200 with 480,000 album-equivalent units, making it the second-biggest streaming week for an album. It was Lil Wayne’s fourth U.S. No. 1 album. Musgraves is having a massive 2019, and has won two Academy of Country Music Awards (Album of the Year & Song of the Year), and three Grammy's (Album of the Year, Best Country Song, and Best Country Solo Performance). The full lineup can be seen at the bottom of the post.